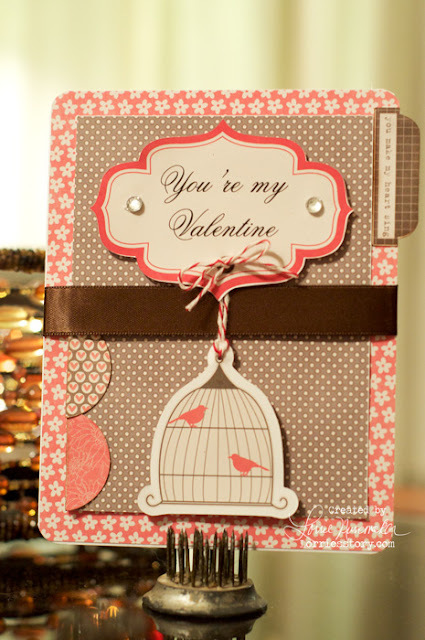 I made this cute Valentine card with the Pink Paislee Spellbound Digital Elements & Papers. You can get them at Jessicasprague.com just click on the link above. I adore Pink Paislee. The papers in this kit just OOOZE Valentines, but could very easily be adapted for any number of girl pages, adult pages. The tags are all blank so you can add whatever sentiment (digital or stamp) that you like. I cut them out with my Silhouette Cameo. I am LOVING the Silhouette. Already I've used it more than I ever used my Cricut. I find it so much more versatile. Valentines is right around the corner... have you made any cards yet?